Although approximately 31,000 licensed nurses currently work in Oregon, the US Department of Health and Human Services has predicted a shortage of around 6,000 nurses by 2025 – especially within frontier counties and rural areas of the state. For individuals with a passion for serving patients in need, Oregon’s nursing industry is ripe with growth, and promises exciting opportunities for a rewarding career. Prospective students considering this health care field can use the following guide to explore nursing schools in Oregon as well as learn about licensure requirements within the state. 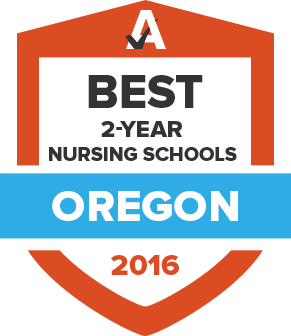 With a commitment to providing excellent educational opportunities for prospective nursing students, the Oregon Consortium of Nursing Education was created in 2008. This partnership brought together nine community colleges and six campuses of the Oregon Health & Science University School of Nursing to address the state’s evolving health care needs. With nearly 50 state-approved nursing programs, students looking to learn in Oregon should have no problem finding a program that fits their needs. Use the search tool below to find your match. To become a licensed registered nurse in Oregon, graduates must fulfill a number of requirements set forth by the Oregon State Board of Nursing. This government agency is responsible for overseeing issuance of initial state licenses, relicensing, renewals, complaints, and competency evaluations. The following section outlines steps required to receive an initial license, as well as an overview of the steps to renew an active license. Nurses are also required to complete a one-time, seven-hour continuing education course on pain management to renew their license the first time. The license renewal fee for RNs is $145. Licenses that have already expired can be reinstated, provided RNs complete a national criminal background check and meet education, practice and legal requirements for the particular type of license they seek. Candidates pursuing reinstatement must also complete the pain management CEU course. The fee for reinstatement is $160. For more detailed information on advance practice specialties, required practice hours, and renewing an APRN license, visit the Oregon Board of Nursing. Nurses in Oregon enjoy a variety of benefits, and legislation has been passed to improve working conditions and enhance job placement. The state is also known for being one of the top five highest paying locations for nurses in the nation. The following statistics give prospective students and recent grads an idea of how the Oregon nursing field stacks up against the rest of the country. Serving as the professional voice of Oregon’s nurse practitioners, NPO was established as a special interest group of the Oregon Nurses Association in 1977. The OCN advocates on behalf of nurses and draws attention to health care issues affecting nursing within the state. The organization also collects and disseminates research and data relevant to nursing and fosters collaboration amongst nurses. This association is a state affiliate of the national ENA and offers professional development, educational opportunities, networking events, and research for emergency nurses looking to enhance their ability to provide excellent patient care. The OFNHP represents more than 3,500 nurses and health care professionals in Oregon and Washington, providing a vast set of resources and member benefits. The Oregon Nurses Association, which was founded in 1906, is a professional membership association open to all nurses in the state. The mission of the ONA is to advocate for nursing professionals, improve health care and act as a labor union. OSNA is the official state chapter of the National Student Nurses' Association, offering resources and opportunities for networking to student nurses in the state.